Ankur Jain is a Happy Kuverian. 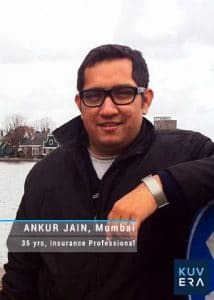 An insurance industry professional working in Mumbai, he has been investing in Mutual Funds for more than 10 years. Ankur shares his experience of investing with Kuvera, India’s friendliest Direct Plan Investment Platform. I heard about Kuvera through my friends who are using the service. Earlier, I was investing through a broker. No, I did not. All my investments were in regular plans of Mutual Funds. I was surprised to find out that I pay commissions indirectly when I invest through the agent. My investments were automatically getting mapped to the agent’s distributor code(ARN No) and the agent was receiving commissions from the fund house. Thanks to you guys for helping me discover this leakage from my hard earned money. I have a young boy and have planned for his higher education and to grow my money. Surely, I already have and will continue to do so. The fund recommendations suite my requirements well. I love that I can invest in under 5 minutes whenever i want and not pay any hidden charges and expenses. I find it re-assuring that I won’t pay more as my portfolio grows in size. Superb customer service. My queries were resolved very efficiently. Keep up the good work and bring more innovative solutions to the market. Thank you Ankur for your kind words and Happy Investing!